Since 2005 we have helped thousands of businesses, all the way from small stores to multinational retailers, with SMS advertising and text message notification needs. Our focus continues to develop our software so that your business can get the features you want for a price that is fair. Below you will find our Top 10 Frequently Asked Questions about our online text message software and you if you get stuck, you can always contact us at any time for help and assistance. 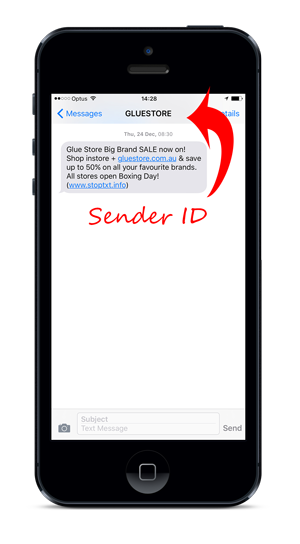 Sender ID is what you see on your mobile as the sender of the message when you receive an SMS. Our system allows you to change this sender ID to be a combination of letters or numbers. You can set it to be 11 characters or shorter. Sender ID can be a powerful branding tool as it can instantly give you a very professional look and feel. If you like, you can also use your business phone number as the sender ID. In this way people can quickly call back on your business number. Please note that customers are not able to reply to your messages unless you are using your mobile number or a dedicated number from us as the sender ID. How many characters can I have in my SMS? Standard SMS length is 160 characters. You can send longer messages using a process called concatenation. For this to work hidden characters are used to join the SMS together and deliver them to the customer as one message. The carriers charge us for every SMS block, so we must pass on these cost to our users. For example: If you have a message that is 2 SMS in length and you send it to 5 people, you will use 10 credits. 1 SMS block = 1 messaging credit. Spaces count for one character and line breaks count for two characters. Due to the use of characters to join the messages there are inconsistencies in the total length of the SMS. See the table for examples. How reliable is the delivery of my messages? As we rely on Australian mobile networks for the message delivery, we are unable to provide a 100% guarantee of timely delivery, but as a rule of thumb over 95% of all messages get delivered within 30 seconds of being sent. How fast will my messages be delivered? Single SMS messages usually arrive to the handset within a few seconds of being sent. Delivery times may vary depending on the target network and congestion levels on the network during sending. Please be aware of a realistic delivery rate of 50,000 messages per hour for large blasts. If you are looking at sending more than 20,000 messages for the first time, we recommend informing us before hand. We can then make sure that your users receive the message in time and as intended. How do I add contacts into the SMS Messenger App? Once you are inside the Address Book, click on the ‘Add Contacts’ link next to the folder you wish to add contacts to. The system will allow you to import a CSV file or database directly to your chosen folder. Locate your contacts file on your local computer to start the importing process. Importing can take some time depending on the size of your file, please be patient. The paste options allows you to import contacts directly from the text box in front of you. Simply choose the types of contacts you wish to import and paste your contacts into the box (one contact per line). This option allows you to manually type in the data to the address book. There are two custom fields that you can use for your own custom purposes, for example for discount codes, customer numbers etc. You can let us have your address book and contacts setup for you. This is completely free of charge and we can take any file type or format and will have it setup for you in a manner of minutes. How can I find out who has unsubscribed/opted out? SMS Messenger App comes with a military grade optout tracking system, which is fully compliant with Australian legislation regarding electronic sending of messages. The system keeps track of all unsubscribe requests quietly behind the scenes. As long as you have included the built-in unsubscribe instructions in your outgoing messages, the system will handle the rest. In order to see how many people have opted out and export those details, you must have contacts uploaded and stored in your address book. You can then view all your unsubscribed contacts at ‘Optout Contacts’ section. To see how many users have opted out of an individual folder go to that folder and you will see a summary of the specific folder you are in. How can I see replies to my SMS? By default, all accounts are setup as 1-way accounts. 1. You can specify your own mobile number as the sender ID. In this way all the replies will arrive to your mobile (or to a dedicated mobile just for this purpose). There are no additional charges for option 1 – it is forever free. 2. Go to the ‘Incoming SMS’ section and you will see all the replies displayed conveniently on one page. NOTE: ‘Incoming SMS’ feature is only available for 2-way messaging clients with their own dedicated virtual number. Please contact us for details and pricing of dedicated lines. Can I schedule messages to be sent later? Yes, of course. After you have composed your SMS message you can specify a future date and time when the messages will be sent out. You can also set messages to repeat at certain intervals, for example, once a month or even annually. The scheduling feature also allows you to make sure that the time zone matches the state or country where you sending messages to. Once you have scheduled messages to be sent in the future, you always have an option to view, edit or delete your scheduled messages. Are my contacts kept secure and private? Credit card is by far the most efficient method. You are able pay using Visa, MasterCard, American Express and any other PayPal supported method. Please note your credit card information is never stored with us as all payment processing is handled by PayPal Australia. We also support EFT payments and we can also invoice you monthly based on your usage. Contact us using the form below to discuss the options. Do you have a question that you couldn’t find an answer for? Let us know and we’ll jump right into it.